aha Lesedi tourism trainees graduate at the top of the S.A Tourism Mandarin programme. Two tourism practitioners from aha Lesedi; Phelisa Matyolo and Ziyanda Mtshali were among a group of 20 trainees who were selected to partake in the Tourism Department’s Mandarin programme. The trainees were selected from establishments frequented by the growing number of Chinese tourists visiting South Africa, an estimated 58 000 tourists in the first half of 2016, according to the Chinese Embassy. 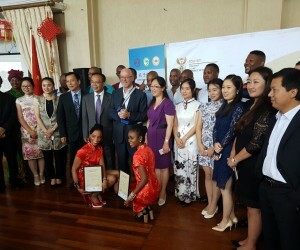 The programmes original inception was in 2013 when the South African government and the People's Republic of China signed an agreement to cooperate within the tourism sector, 3 years on the programme has produced the first 20 tourism practitioners who are now fluent in Mandarin, achieving an impressive pass rate of 88%. The aha Lesedi tourism practitioners; Ziyanda Mtshali andPhelisa Matyolo and were the top two in their class, with respective results of 96.35% and 96.3%. Neil Bald, aha Hotels & Lodges CEOlauded the Department of Tourism, the Chinese Culture and International Education Exchange Centre including all stakeholders involved for the successful implementation of this programme, hailing it as a milestone for the sector. aha Hotels & Lodges Group HR|IR Manager, Ms. Nondumiso Mngadi elaborates that the company continuously seeks out opportunities to develop and empower its employees and is extremely proud of the trainees’ accomplishment. Phelisa, began her career at aha Lesedi in November 2008 as a dancer; through hard work and determination over the years, she’s now an Assistant Cultural Manager, tour guide and still an active dancer. Ziyanda started as a dancer in 2012 and is currently a tour guide and dancer, with ambitions of being in charge of marketing for aha Lesedi in the near future. They beam with pride as they relate their experiences, explaining how daunting the programme was at first and how they doubted they would make it through the training, being introduced to a new language that seemed so difficult to grasp. The gruelling 3 months programme entailed reading, writing and speaking with situational role playing sessions. The Mandarin language is spoken by an estimated 1000 million people, mainly in the People’s Republic of China; one of South Africa’s largest trading partners. 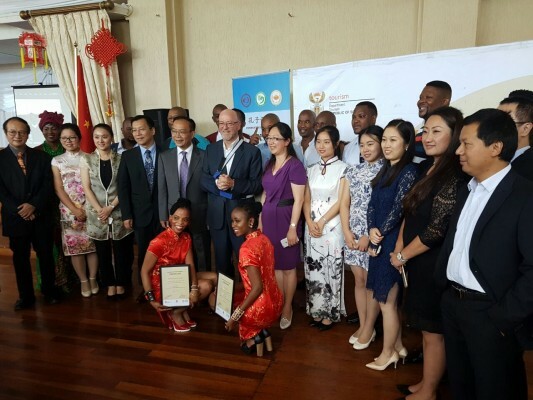 The trainees were presented with their certificates by Tourism Minister Derek Hanekom at a ceremony held on 29 November 2016, attended by the Deputy Ambassador of China; Hon. Li Song, Dr. Zhilei Lu, Director of the Chinese Culture and International Education Exchange Centre; Mr. Lloyd Moeng the General Manager of aha Lesedi; and aha Hotels & Lodges, Group HR|IR Manager, Ms. Nondumiso Mngadi, as well as various industry representatives and stakeholders. “The simple language exchanges will go a long way in making sure that we receive more Chinese tourists in this country” says Minister Hanekom. Adding further, “The ability to communicate in the language of our visitors reduces their levels of anxiety when they arrive and try to find their way around a place they are not familiar with. It makes them more confident and they can relax and enjoy their stay”. Ambassador Song said the relationship with South Africa was growing and at its best levels ever. Congratulating the trainees on their journey, Song said it would have value in their lives going into the future, "You will not regret all the time and energy that you put in the learning of the Chinese language. Your language skills will pave a way for a lot of opportunities in the future." The trainees will head to China in the next coming weeks to learn and experience more about the culture. They are hailed as the first group of pioneers in this field, opening a pathway for many to follow.